Sadly, the hummus wizard was stopped in a little village where the only source of food was pita bread. I did a guest comic for ARG who has to play catch up at work because of all the hookey he played at ECCC! Check it out here. I once heared, that wizards don’t know right from wrong. Plus, is it really healthy to eat muddy bacon? Bacon is always healthy no matter what dressing you favor, my good sir! This is very good to know. I thank you Sir Kex of Internetwebcomic-a, though have brought joyous cries throughout the kingdom. Twas’ a pleasure, good citizen! I shall ride throughout thy kingdom and spread the news of thine Lord Bacon! That Bacon Wizard is awesome! Vegetarians who don’t have the skill to grow crops? Sell the bacon, buy food. 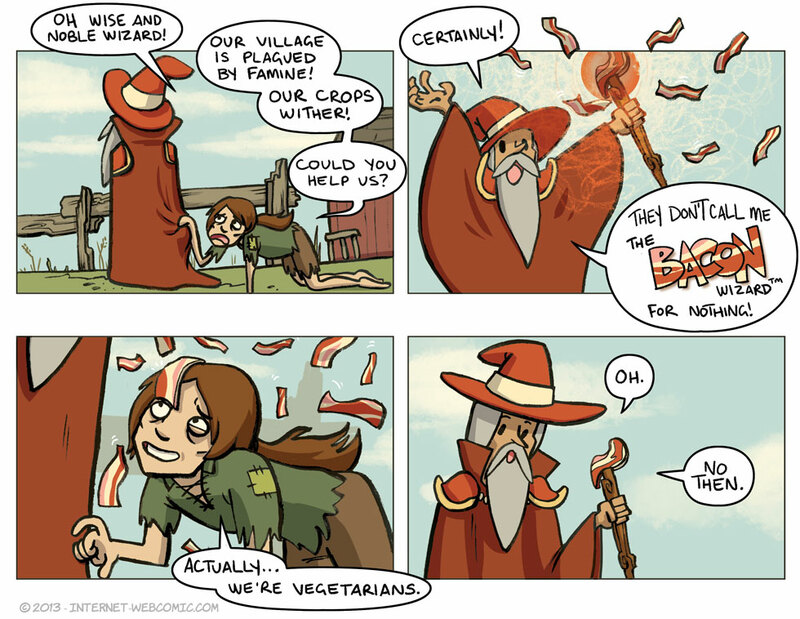 We need to see more of the bacon wizard. Clearly they deserve to starve. As a self-proclaimed Bacon Enthusiast, and procurer of all things bacon, such as the Bacon Song by Five Iron Frenzy, I suddenly find myself desiring to pay you all my nonexistent monies. But sadly, they are non ecosystems. Kind of makes me wish I ate bacon. Am hoping I can use this for something..